Increasing contraceptive use by improving access to contraceptives in sub-Saharan African countries is often studied from the perspective of increasing stocks  improving health care facilities  and bringing family planning services to where women live . However, if the laws associated with the sale and distribution of contraceptives are strict then their rigidity limits the implementation of practical solutions to expand the supply chain. In this paper, we examine the association between contraceptive laws and modern and traditional contraceptive use in sub- Saharan Africa, taking into account colonial origin. The legality of contraceptive use varied among French and the British provinces at the time of independence, and the legacy of the stricter French environment may resonate through to the present . The uptake of modern contraception, or utilization of traditional methods of fertility regulation, can increase due to demand side pull factors such as decrease in lower family size, preference for increased spacing between births, or the desire to delay the first birth. Meeting this demand, or even creating this demand through ideation, is matched by supply side push factors such as information campaigns, clinic stocks and distribution to the women and couples, supply chains, and technological development. The barriers to contraceptive use, then intercept these demand and supply side factors. Transport costs, incorrect information (shared informally between friends, say), fear of side effects, reality of side effects, partner opposition, and provider attitudes are all commonly listed and prevalent barriers to contraceptive [5-22]. However, the legality of contraception is an overarching barrier to contraceptive use. If modern contraception is illegal, then supply side is limited, and demand creation is also limited. The sale of modern contraception may also be legal, but the point of sale may be regulated, modes of information dissemination may be restricted, and qualifications of the provider may be required. Thus, legality of modern contraception is not a dichotomous variable, but rather a scale on the degree of legality. We hypothesize that women who live in a country and a time with more liberal contraceptive laws, have higher contraceptive use. We also consider the colonial origin of the sub-Saharan African country, as the French colonies had stricter laws than the British at the time of independence. While laws have liberalized to varying degrees since the time of independence, the differences in the legal status of contraception at the time of independence may affect contraceptive use in the present. That is, strict environments may resonate across time, even in the face of contemporaneous liberal laws. Thus our second hypothesis is that contraceptive use may be lower for countries with strict colonial origins, even if the currently legal status is equally liberal. Furthermore, a contemporaneous liberalization in the former French colonies will have a smaller impact on contraceptive uptake than in former British colonies. The contraceptive laws, and their changes (liberalization), can reflect a broader change in the family planning and reproductive health landscape. In Ghana, for example, Stepan and Kellogg  find that the liberalization of the abortion law in 1985 was in response to a widespread drought in West Africa that was affecting food supply. The government liberalized the law to give women greater control of their fertility. (Note, the Finlay and Fox paper examines abortion laws, but in this paper we focus only on contraceptive laws.) Thus a contemporaneous liberalization of the contraceptive laws, may not be a stand-alone event, and may happen in response to – or simultaneous to – other changes in the legal or policy environment that impact contraceptive use. The colonial legacy of the laws, and how this impacts current contraceptive use and also how it impacts current response rates to current liberalizations of the law, has not been studied to date to our knowledge. Others have examined fertility trends during colonial times in response to colonial policies. For example, Stepan and Kellogg  describe how policies during colonization had an effect on fertility. Using the example of the Dutch colonization of Indonesia and the rise of fertility during that time due to policies of the Cultivations System of compulsory labor services (and Henley finds that labor force participation and fertility increased during this time). In another study by Stepan and Kellogg , they also examine the impact of colonization on triggering the onset of the fertility decline. Using the example of colonial history and the diffusion of modern ideas in triggering a fertility decline in areas where language of the colony was more readily adopted. In this paper, however, we take the first step to understand how current legal changes affect contraceptive use. And moreover, we examine how the colonial origin affects the increase in contraceptive use when there is a liberalization in the postcolonial contraceptive law. To do this, we present our methods for analysis, results and discussion. In this paper, we consider 21 sub-Saharan African countries, 11 of British colonial origin, and 10 of French colonial origin. Each of these countries became independent of their respective colonizer during the late 1950s or early 1960s. Firstly, we consider the 21 countries together, and examine the association between the contraceptive laws (five-years lagged) and contraceptive use between 1990 and 2014. We then divide the sample by colonial origin to compare the effect size of a current liberalization of the law (five-year lag) on current contraceptive use to see if stricter colonial origins (of the French colonies) resonates through to current responses to legal changes. The countries that we consider in this sample are the former French colonies of Benin, Central African Republic, Chad, Cote d’Ivoire, Gabon, Guinea, Madagascar, Mali, Niger, and Togo. And the former British colonies of Ghana, Kenya, Lesotho, Malawi, Nigeria, Sierra Leone, South Africa, Swaziland, Tanzania, Uganda, and Zambia. These 21 sub-Saharan African countries are within the sample as they are in sub-Saharan Africa, are former French or British colonies, have available recoded data from the Demographic and Health Surveys (DHS) that can be merged with the contraceptive laws database. The DHS are a repeated cross section, nationally representative, data collection effort in low- and middle-income countries administered by ICF International [26-27]. They encompass more than 82 countries and include multiple surveys conducted on average every five years. The survey years for each of the sample countries are list in Figure 1. There 21 countries within the DHS representing countries in sub-Saharan Africa that are of British or French colonial origin for which we had data on the contraceptive laws. Starting with a sample of N=655,387, 965 women dropped from the sample for missing data on current contraceptive use. Not all surveys had wealth index data and this dropped a further 134,670. A further 50 women did not have information on education. This left the final sample of 519,621 women. 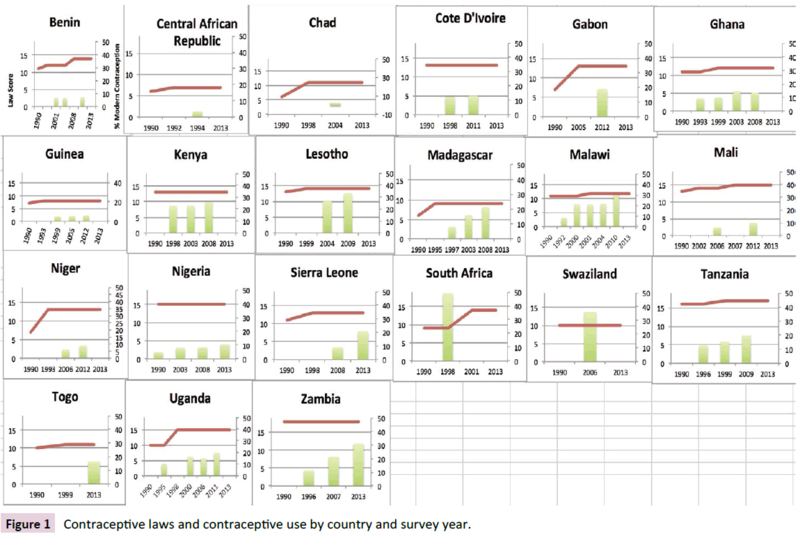 Figure 1: Contraceptive laws and contraceptive use by country and survey year. We consider the laws for the contraceptive pill (legal status, purpose of sale, location of the sale, prescription requirement, subsidies), IUD (legal status, doctor inserts or other), and sterilization (legal status). Table 1 details each of the index values. The index of contraceptive legal restriction was generated as an aggregate of each of the laws on the pill, sterilization and IUD. For each country and year data point, we added across the categories of the index. For example, if the pill was legal for contraceptive purposes (score 2), bought in a pharmacy but not a shop (score 1), required a prescription (score 1), was commercially available but not subsidized (score 1), and was legal to advertise with some restrictions (score 3), then this country/year would have a value of eight out of a possible 13. Where 13 would be the most liberal case. For IUD, if it were illegal (score 0) then it would not have laws for qualifications of the provider as none would be provided (score 0). This would give this country a score of zero out of a possible three for the most liberal case. For sterilization, if it were legal for contraceptive purposes, it would score three out of a possible three. Thus, across the three modern contraceptive methods, this country year would score a total of 11 out of a possible 19. For each country-year data point we then ranked them by their total score, and divided the sample into three countryyear groups according to the cut-pints up to and including seven as strict, between eight and thirteen as moderate and between thirteen and nineteen as liberal. This index was contracted by Boye et al. using a range of sources [29-31] United Nations Fund for Population Activities, International Advisory Committee on Population and Law, United Nations Population Fund, & School, Annual Review of Population Law. Law and Population Monograph Series. New York and Cambridge, MA: United Nations Population Fund and Harvard Law School. The outcome variable is current contraceptive use. Current contraceptive use in our analysis is represented as a categorical variable: not using, currently using traditional methods, or, currently using modern methods. Traditional methods include: withdrawal, periodic abstinence, abstinence, lactational amenorrhea (LAM), standard days method and other country specific methods such as charms and using traditional healers. Modern methods include: pill, IUD, injections, diaphragm, condom, female sterilization, male sterilization, implants/norplant, female condom, emergency contraception, and foam or jelly. Table 1 Modern contraceptive laws. The exposure of interest is contraceptive law, and this is a categorical variable representing strict (baseline), moderate and liberal legal environment within the country. Demographic and social variables are also included as control variables. Wealth of the household the woman lives is a relative measure of wealth (based on assets help by the household) and is grouped into quintiles: poorest (baseline); poorer; middle; richer; and richest. Educational attainment of the woman is also controlled for and is grouped into categories: no education (baseline); primary; secondary; and higher. Urban (baseline) and rural living is also accounted for. Women’s age is also controlled for, and we group by five year intervals in an attempt to smooth any misreporting of age: 15-19 years old at the time of survey (baseline); 20-24; 25-29; 30- 34; 35-39; 40-44; 45-49. The number of existing children a woman has also influences here contractive use decision. We proxy this with number of children ever born as children who have died may increase or decrease demand for contraception depending on the altered preferences of the woman following the death of a child. We categories this as: no children (baseline); one child; two children; three children; four children; and five or more children. Some women did not have the demographic and social variable information, and our total final sample was 519,621 (Figure 2). Figure 2: Sample selection tree, final sample size is highlighted (519,621 women). With the outcome measure of current contraceptive use as an unordered categorical response variable, we use the multinomial logistic mode to estimate the association between the contraceptive pill laws and modern contraceptive use. All regressions include robust standard errors and clusters the standard errors at the cluster level to account for the sampling design. We estimate several multivariate models, all of which also include demographic and social indicators to control for the characteristics of the woman that affect contraceptive use independent of the legal status. We also include country fixed effects. We pool the 21 countries in the analysis and then stratify by colonial origin. Figure 1 shows the relationship, by country, between the outcome variable (contraceptive use) and the exposure of interest (contraceptive laws index). In Table 2 we show the correlation between the contraceptive laws and the demographic and social covariates. This highlights any collinearity between the exposure of interest and the control variables, and would indicate if the laws are a proxy for SES development, and if they were, we would see that more liberal laws are associated with higher income, higher education, and greater urbanity. Firstly, though, we see that of the total sample of 519,621 women, in terms of the contraceptive laws index, 5,884 are in strict environments (country/year), 290,914 are in moderate legal environments, and 222,823 are in liberal environments. Wealth distributions are fairly even across the legal environments, but this is representative of the relative wealth index. Thus for each country/year, the sample is divided evenly into five groups of equal size across the population. We see that the country/years with stricter laws have a greater concentration of women living in urban areas, with the average in the sample of 35.3% urban, but for the strict country/years it is 42% urban. On average 36.5% of the women in the sample have no education or incomplete primary school. For country/ years with liberal laws, they have 34.6% with no education or incomplete primary. Countries/years with more liberal laws have higher levels of education. 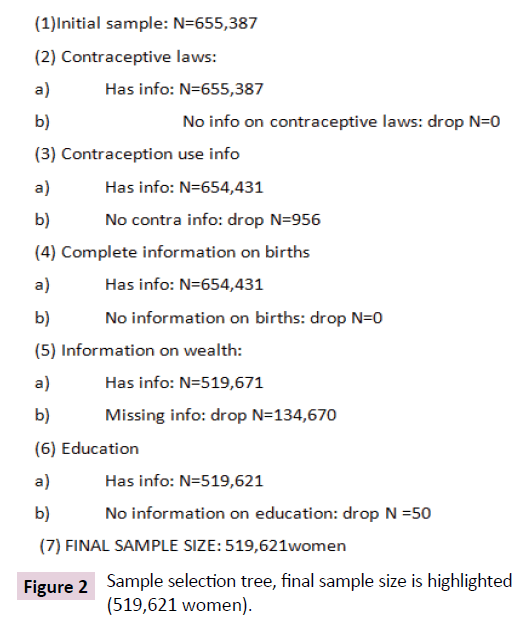 Table 2 Legal regulation of contraceptive method, broken down by covariates. In terms of age categories, age structure is in part a proxy for past fertility. In our sample, this is combined with women meeting the eligibility criteria for inclusion in the sample. We see that age distribution is even across the legal environments. In terms of total number of children, we see that the number of children is even across legal environments. Table 3 illustrates the correlation between contraceptive use (the outcome variable) and the demographic and social covariates. From Table 2 results, we see that 15.8% of the sample use modern contraception, 4.9% report to currently use traditional contraceptive methods, and 79.3% of the sample use no form of contraception. The richest (22.8%) have the highest fraction using modern contraception over traditional (7%) and non-use (70.3%). Those in urban areas use modern contraception (20.5%) at a higher frequency than the population average (15.8%). Women with some education (primary 18.8%, Secondary 22.9%, Higher 31.4%) use modern contraception at a higher frequency than the population average (15.8%). Those with no education, use modern contraception (6.6%) at a rate much lower than the sample average (15.8%). Table 3 Frequency and percentage of women broken down by the type of contraceptive method they use and covariates. Women in their teen years, 15-19, are less likely to use modern contraception (7.3%) than the sample average (15.8%). Women with two children (20.3%) are more likely to use contraception than a women with no children (8.4%). This may indicate that women are using contraception to space and limit their births, but not to delay the first birth. In the univariate model (Table 4), not adjusting for covariates, we find that women living in countries and times with moderate contraceptive laws have the highest likelihood of using modern contraception. Comparing moderate to strict legal environments, the relative risk of using modern contraception to not using any contraception would decrease by a factor of 0.174, and the relative risk of using a traditional method as opposed to not using contraception would increase by 1.696 times. For women living in a liberal legal environment as opposed to a moderate legal environment, the relative risk of using traditional contraception to not using any contraception would decrease by a factor of 0.744. Also, for women living in liberal legal environments as opposed to moderate legal environments, the relative risk of using modern contraception to not using contraception would decrease by a factor of 0.748. In the univariate analysis, moderate legal environments are associated with the highest chance of using modern methods, and moves to both strict and more liberal laws are associated with risk of lower use of modern methods. Table 4 Univariate logistic regression of laws (independent variable) and contraceptive method (dependent variable) reporting relative risk ratios. When adding in controls for wealth, education, age, and number of children (parity) the associations between legal status of contraception and contraceptive use is still significant (Table 5, set 1). Without country fixed effects in regression set 1, the coefficients represent the cross-country relationship. We find that in countries/years with strict laws compared to moderate laws the relative risk of using traditional contraception as opposed to not using any contraception increase by 1.904 times. We find that even when controlling for the demographic and social variables, women in countries/years with liberal laws (as opposed to moderate laws) decrease the relative risk of using traditional methods as opposed to not using contraction by a factor of 0.682. For modern contraceptive use, those countries and times with moderate laws had the highest chance of using modern contraceptives. For women living in strict legal environments as opposed to moderate legal environments, the relative risk of using a modern contraceptive as opposed to not using contraception at all would decrease by a factor of 0.199. And also for those women living in liberal legal environments as opposed to moderate legal environments, the relative risk of using modern contraception as opposed to not using contraception at all would decrease by a factor of 0.674. Table 5 Multinomial logistic regression reporting relative risk ratios for multivariate model (1) and multivariate model with country fixed effects (2). When we add fixed effects, Table 5 set 2 regression, this is now a within-country comparison. We find that countries/years with more liberal laws compared to moderate laws the relative risk of using modern contraception as opposed to not using any contraception increase by 1.360 times. We find that even when controlling for the demographic and social variables, women in countries/years with liberal laws decrease the relative risk of using traditional methods as opposed to not using contraction by a factor of 0.564. Moving from moderate to strict laws decreased the risk of using modern contraception by a factor of 0.490, and had no statistically significant effect on traditional contraceptive use. Across countries (regression set 1) moderate laws are associated with the highest chance of modern contraceptive use. However, within countries over time (regression set 2), women exposed to more liberal laws see higher modern contraceptive use. Recalling that in the data we have built in a lag structure, so that it is the legal status five years prior to interviews and the reporting of current contraceptive use. In Table 6 we then stratify by colonial origin. There were no British colonies with strict current laws. Controlling for fixed effects, we find that women in a former British colony with liberal laws as opposed to moderate laws, the relative risk of using modern contraceptive methods compared to not using contraception increases by 1.761 times. For the French, we find that women living in countries and time with liberal laws as opposed to moderate laws, the relative risk of using modern contraceptive methods compared to not using contraception increases by 1.093 times. The fact that the French had stricter laws at the time of independence, may resonate through to today and as the laws are liberalized women are less likely to respond to this liberalization in the former French colonies than in the former British colonies. Table 6 Multivariate multinomial logistic regression reporting relative risk ratios with country fixed effects and stratifying on colonial origin,(note: British colonies do not have any countries with strict laws). In this paper we shows that women exposed to more liberal contraceptive laws are more likely to use modern contraception. Moreover, women who are in the former British colonial countries will respond more acutely to a liberalization of the law than women from the former French colonies. The French had stricter contraceptive laws at the time of independence, and this resonates across time to affect current contraceptive use, and response to current liberalizations of the contraceptive law. The contraceptive laws fall under the broader family laws and in some former French colonies these have been slow to liberalize. But when the contraceptive laws do liberalize in the former French colonies, the change in contraceptive use is not significantly different from zero. Whereas for the former British colonies – that had more liberal contraceptive laws at the time of independence than the former French colonies – there is an increase in contraceptive use when the contemporaneous law increases. This indicates that there is a legacy in the strict environment in the former French colonies. The effects of the strict laws during the colonial era and at the time of liberalization resonate into the present day, such that even with a liberalization of the current law there is no change in contraceptive use. Women hold onto the values that the stricter laws reinforced, and a current liberalization in the law has no effect on the contraceptive use. The colonial powers left not only a legacy of contraceptive laws, and at the time of independence for African countries the entire constitutional landscape was affected by the legal framework the former colony left behind. Thus, various laws, and not just the contraceptive laws may have affected post-colonial fertility trends. For example, the British colonial laws were more conducive to female education than the French colonial laws. And following our understanding of the relationship between female education and fertility, the higher education in the former British colonies would have encouraged lower fertility. To achieve that lower fertility, contraceptive prevalence may have thus been higher in the former British colonies than in the former French colonies. To our knowledge, this is the first paper that puts forward this result of the lasting effects of colonial origin on current contraceptive use across the former British and French colonies in sub-Saharan Africa. Austria describes how the legacy of the strict colonial (Spanish) laws in the Philippines resonated into the post-colonial ear and shaped the conservative trend within that country. In that paper, they describe how the conservative colonial origin, then mixed with the strong Catholic rhetoric on reproductive health, blurred the boundaries between religion and state for the Philippines in the realm of women’s reproductive health. The continent of sub-Saharan Africa and compares a group of countries who were former British colonies with a group who were former French colonies. Extending our examination beyond a country-specific example, to highlight an issue of colonial origins rather than a specific country’s’ postcolonial trajectory. There are a number of limitations in our study, principally stemming from the two datasets that we use. Specifically for the Demographic and Health Surveys, women’s reports of their current contraceptive use, the as this measurement error is not systematically correlated with the laws, then we would not expect this to bias our results. In places where the contraception is illegal there may be a tendency for women to misreport using contraception. Given that none of the countries examined actually completely outlaw any contraceptive method, rather legal restrictions tend to occur at the level of advertisement or location of sale, misreporting of contraceptive use is not likely to be correlated with contraceptive laws. Another issue that points toward interpreting these results cautiously is that we use the written law as our independent variable. Laws are not always implemented or implemented uniformly, for example, those countries that outlaw the sale of contraception without a prescription may not enforce the law such that there may be some pharmacies that sell birth control without a prescription. Thus, laws do not mean that contraception is more accessible in liberal environments in all cases and that strict laws do not mean that contraception is less accessible in all cases. What it does tell us about is that on average, in strict contraceptive law countries and time, there are likely to be more barriers to access and knowledge on contraception than in moderate or liberal countries and times. Moreover, with the legal database, in constructing the contraceptive laws, each legal difference receives a one-unit change. Thus a shift in the law of the contraceptive law from being sold in a pharmacy to being permitted to be sold in a shop gets a one-unit change, as does a shift in the IUD law of doctor having to insert to doctor or other (nurse) being able to insert the IUD. Each change in the laws is thus weighted equally. Despite the limitations of the two datasets, our analysis puts forward an argument for the need to eliminate barriers to accessing contraception through the law. Making aspects of contraceptive access illegal, such as public advertising, which could increase knowledge on types of contraception, only stands as a barrier to women’s use of modern contraction. Furthermore, working with the former French colonies, overcoming stigma of contraception created by earlier strict laws is an additional hurdle that needs to be addressed in the former French colonies more than the former British colonies. We would like to thank David Canning for helpful comments on the draft. Thanks to June Po worked on legal database. Comments from the audience at Population Association America 2017 meetings were helpful in refining the draft, and also those from the 2015 Global Health and Population seminar. Priedeman Skiles M, Cunningham M, Inglis A, Wilkes B, Hatch B, et al. (2015) The Effect of Access to Contraceptive Services on Injectable Use and Demand for Family Planning in Malawi. International Perspectives on Sexual & Reproductive Health 41: 20-30. Maletela T, Madise NJ, Diamond I (2004) Provision of Family Planning Services in Lesotho. International Family Planning Perspectives 30: 77-86. Weaver EH, Frankenberg E, Fried B J, Thomas D, Wheeler SB, et al. (2013) Effect of Village Midwife Program on Contraceptive Prevalence and Method Choice in Indonesia. Studies in Family Planning 44: 389-409. Bongaarts J (1984) Implications for future fertility trends for contraceptive practice. Population and Development Review 10: 341-352. Feyisetan B, Casterline JB (2000) Fertility Preferences and Contraceptive Change in Developing Countries. International Family Planning Perspectives 26: 100-109. Wood K, Jewkes R (2006) Blood blockages and scolding nurses: barriers to adolescent contraceptive use in South Africa. Reprod Health Matters 14:109-118. Finlay J E, Fox AM (2010) Reproductive health laws and fertility decline in Ghana. International Journal of Gynecology and Obstetrics 123: e24-e28. Henley, D. (2011). Forced labour and rising fertility in colonial Indonesia. Asian Population Studies 7: 3-13. Basu AM, Amin S (2000) Conditioning factors for fertility decline in Bengal: History, language identity, and openness to innovations. Population and Development Review 26: 761. Corsi DJ, Neuman M, Finlay JE, Subramanian S V (2012) Demographic and health surveys: a profile. International Journal of Epidemiology 41: 1602-1613. Demographic and Health Survey (1996) Sampling Manual. DHS-III. Retrieved from Calverton. MD. Anonymous (1980) Worldwide laws and policies on contraception, abortion and sterilization affect service provision. Family Planning Perspectives 12: 210-212. Boland R (1974) Annual Review of Population Law. Lee LT (1971) Law and family planning : background paper for the WHO. Expert Committee on Family Planning in Health Services, Medford, Mass. Law and Population Programme, Fletcher School of Law and Diplomacy, Tufts University. Lee LT (1973) International status of abortion legalization. Medford, Mass: Law and Population Programme, Fletcher School of Law and Diplomacy, Tufts University. Stepan J, Kellogg EH (1974a) The World's Laws on Contraceptives. Law and Population Monograph Series, 17. Stepan J, Kellogg EH (1974b) The World's Laws on Voluntary Sterilization For Family Planning Purposes. Law and Population Monograph Series, 8. Stepan J, Kellogg EH (1973) The world's laws on voluntary sterilization for family planning purposes. Medford, Mass: Law and Population Programme, Fletcher School of Law and Diplomacy, Tufts University. United Nations Fund for Population Activities, International Advisory Committee on Population and Law, United Nations Population Fund, & School, H. L. (1978-1994) Annual Review of Population Law. Law and Population Monograph Series. New York and Cambridge, MA: United Nations Population Fund and Harvard Law School. Rutstein SO, Johnson K (2004) The DHS wealth asset index (no. 6) Retrieved from Calverton, Maryland. Boye AE, Hill K, Isaacs S, Gordis D (1991) Marriage law and practice in the Sahel. Studies in Family Planning, 22: 343-349. Njoh AJ, Ayuk-Etang ENM (2012) Colonialism, female literacy and the millennium development goals in Africa. African Journal of Economic and Sustainable Development 1: 316-328. Austria CSR (2004) The church, the state and women's bodies in the context of religious fundamentalism in the Philippines. Reproductive Health Matters 12: 96-103. Boland R (2002) Chapter 4 Law and Policy. 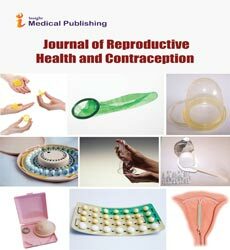 In: Engender Health, Contraceptive Sterilization: Global Issues and Trends. New York: Engender Health.